Sempervivum, those clustering Rosette shaped cuties in the Crassulaceae family, are a great pick for Plant of the Month for December as they are one of the few succulents that can actually survive frost and freezing conditions (unlike most of their “softer” cousins, like echeveria and aeonium). These clustering succulents are also commonly referred to as Hens and Chicks, or House Leeks, and are found all around the globe, although thought to be originating from the middle East and parts of Asia and Europe. Most are hardy to zone 4 (so they can actually survive frost and snow) and can handle warmer climates up to zone 10 (although you will want to protect them from too much direct sun). Did you know that the word Sempervivum literally means “always/forever alive” in Latin? They got this name because they keep their green leaves throughout the winter months and also due to their ability to survive harsh conditions like drought and frost. I do find their name just a bit ironic considering these hardy succulents are monocarpic which means that the plant will actually die after it blooms. Luckily these plants typically take years to bloom and they reproduce readily through lots of offshoots (or pups) pretty much all the time. 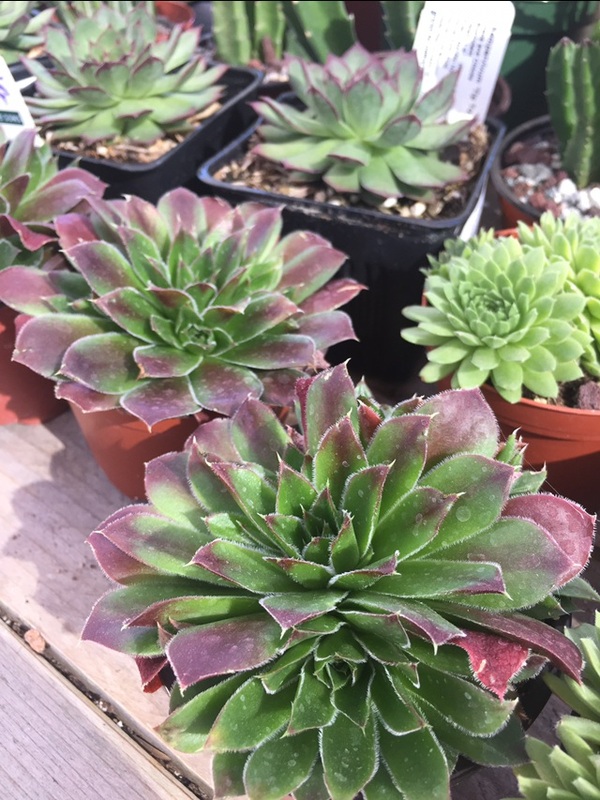 Actually sempervivum are often called “hens and chicks” because of how prolifically they make pups, often looking like a hen surrounded by her chicks. Another common name for sempervivum is houseleek, even though they are not at all closely related to an actual leek (which is in the onion family). This name is thought to have come from the traditional practice of growing plants on the thatched roofs of homes. Kind of makes those birdhouses covered in sempervivum seem super appropriate, right? I was pleasantly surprised to discover that sempervivum have some pretty cool medicinal uses as well. The leaves can be juiced and used topically on the skin on rashes and warts and burns (similar to aloe vera). The juices and leaves have also traditionally been used to stop bad cases of diarrhea. Unlike most succulents, sempervivum can thrive even in frosty conditions, making these plants excellent and popular options for both in ground and container gardening almost anywhere (just don’t overwater). Like most succulents, they do prefer bright yet indirect light and will burn in very bright, direct and hot sun conditions, if not properly acclimated. As plants that store water in their roots and leaves, sempervivum prefer to be planted into soils that is well draining and relatively dry, like sandy or rocky soils. They do not do well with overwatering, so if planted outdoors try not to over irrigate. If planted indoors water only when soil is totally dry (you can use a toothpick or chopstick to check the moisture level). Have any further questions about Sempervivum care?